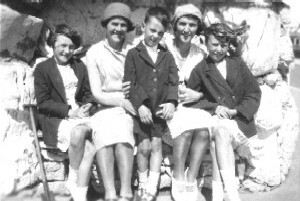 In this picture Jack is second from the right, standing next to his father Sidney. On Jack’s right is his brother-in-law Joe, his sister Lucy’s husband and far left, his brother-in-law Cyril, Ena’s husband (my father). 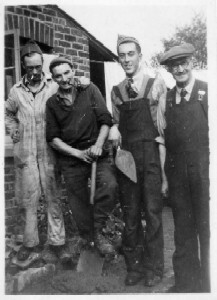 They were working on laying a new garden path at home in South Oak Lane, Wilmslow when they posed for this photo opportunity! 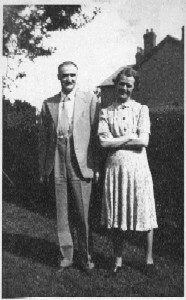 Here is a picture of Jack’s mother and father, Margaret and Sidney Wlliamson, taken in the garden of their home probably in the the early 1950’s. Sidney died round about 1953 if my memory is correct. 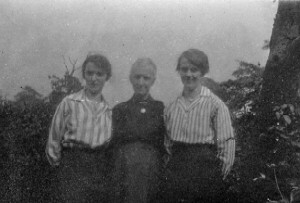 Here is an old photograph of Jack’s mother Margaret on the right, with her sister Bet on the left and I believe it is their mother (Jack’s grandmother, my great-grandmother) in the middle. The photo is rather old so I apologise for the graininess! 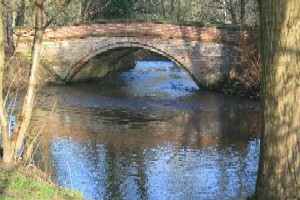 You may remember that way back in November I said I had chosen the theme for this site because it reminded me of the bridge that Jack built over the River Bollin as it runs through The Carrs in Wilmslow, Cheshire. 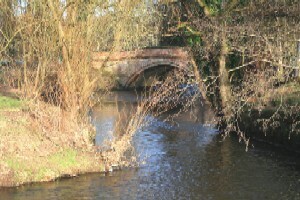 Then on December 6th I posted an old photograph of “Carrs Bridge” sent to me by my cousin David and which we believed to be of the bridge that Jack’s team subsequently rebuilt. I now share with you two views of the renovated bridge. I am indebted to Colin Shepherd of The Friends of the Carrs Society (www.friendsofthecarrs.org.uk) who recently provided these photographs for me. 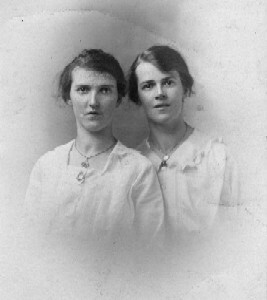 This picture is of Jack’s mother Margaret on the right, with her sister Elizabeth (Aunty Bet) when they were young women. They were always close, and later on lived next door to one another. Jack moved in to live with his widowed aunt, who was childless, after his mother died. 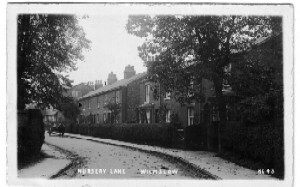 This old postcard view of South Oak Lane, Wilmslow, Cheshire was probably produced before Jack was born but may well reflect how he remembered the scene from his childhood. During his childhood and youth he lived towards the far end, on the left hand side, at No. 69. Later he moved with his mother to No. 73 and then to live with his widowed aunt Elizabeth (Bet) at No. 71. Sometime later he moved to the flat above the Butcher’s shop (not there at the time of this photograph) just up a bit on the right. This shop was owned at the time by his niece (Annie’s daughter) and her husband. 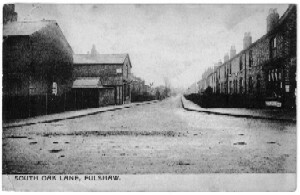 This second picture is an old photograph of Nursery Lane, the opposite side of the square Jack refers to in his poem “My Birthright” (see last post, dated 27th January). The local school that he and his sisters attended was in Nursery Lane.